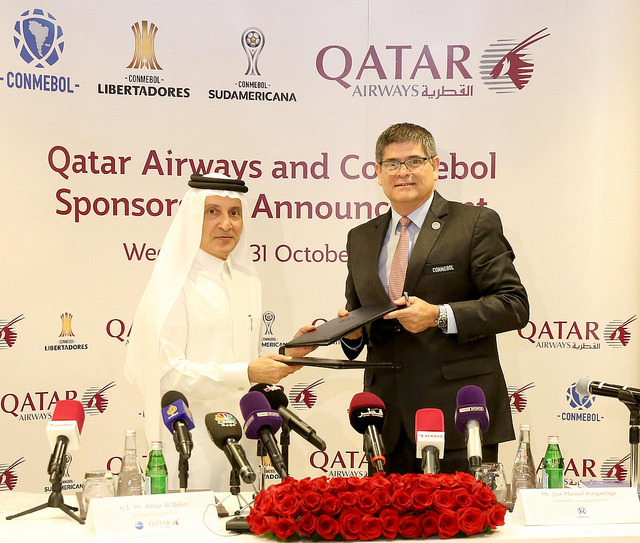 Qatar Airways said it has been named the Official Global Airline Partner of The South American Football Confederation (CONMEBOL), thereby adding another strong sporting partnership to its expanding portfolio. The airline disclosed that the agreement was signed at a ceremony that took place in Doha on Wednesday at the Oryx Rotana hotel, attended by Qatar Airways Group Chief Executive, His Excellency Mr. Akbar Al Baker, and the Secretary General from CONMEBOL, Mr. José Manuel Astigarraga and Qatar Football Association Board Member Mr. Ahmed Al Buainain. According to the airline in an online statement said that the multi-year agreement will provide Qatar Airways with maximum exposure in South America, while strengthening the airline’s global sponsorship portfolio. 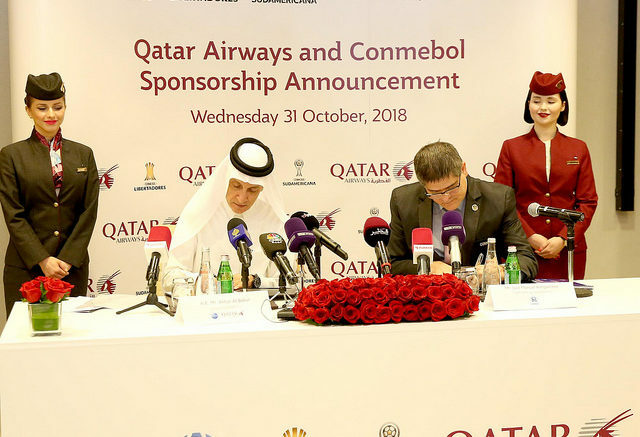 It added that as part of the agreement, Qatar Airways will be the sponsor of CONMEBOL’s professional football club competitions across South America for the next 4.5 years, with immediate effect through 2022, including the Copa CONMEBOL Libertadores, South America’s most prestigious football competition, as well as the Copa CONMEBOL Sudamericana and the CONMEBOL Recopa. The agreement, the carrier further explained was negotiated on behalf of CONMEBOL by FC Diez Media, the joint venture between IMG and Perform Group, set up exclusively to service the confederation. CONMEBOL is the continental governing body of football in South America and is one of FIFA’s six continental confederations. The football entity is responsible for the organisation and governance of South American football’s major international tournaments. Described as the “toughest qualifiers in the world”, CONMEBOL national teams have won nine FIFA World Cups and CONMEBOL clubs have won 22 Intercontinental Cups and four FIFA Club World Cups. Qatar Airways, the first-ever airline partner for CONMEBOL’s club competitions, will leverage high brand association and large audience visibility at all 260 matches in both year-long competitions across the South American continent and will feature beginning with the CONMEBOL Libertadores semi-finals on 31 October. *His Excellency Mr. Akbar Al Baker, and the Secretary General from CONMEBOL, Mr. José Manuel Astigarraga. The airline will also be the presenting and sole partner for the Recopa Sudamericana, the home and away fixture between the champions of CONMEBOL Libertadores and CONMEBOL Sudamericana. Qatar Airways has long celebrated its strong ties with South America. Earlier this year, the airline announced it was the Official Jersey Sponsor of the world-renowned Argentinian football club the Boca Juniors through the 2022/23 season. In addition, Qatar Airways Group acquired 10 per cent of South American LATAM Airlines Group in December 2016 through a strategic investment, further strengthening ties with the continent. Qatar Airways holds an extensive global sports portfolio, sponsoring some of the biggest teams around the world. Earlier this month, the airline announced that it is the Official Global Airline Partner of the NBA’s Brooklyn Nets and the team’s home, Barclays Center, the Brooklyn, New York venue that hosts many of the world’s most exciting entertainment and sporting events. In May 2017, Qatar Airways made known a groundbreaking sponsorship deal with FIFA, which saw the award-winning airline become the Official Partner and Official Airline of FIFA until 2022. The partnership, one of the biggest sporting sponsorships in the world, will give Qatar Airways extensive marketing and branding rights at the 2022 World Cup Qata, with an expected audience reach of more than two billion people. The agreement sees Qatar Airways become the Official Airline Partner of the FIFA Club World Cup, the FIFA Women’s World Cup, the FIFA Under-20 and Under 17 World Cups, the FIFA Beach Soccer World Cup, and the FIFA Interactive World Cup. Qatar Airways proudly flies one of the youngest fleets in the sky, featuring the world’s most technologically-advanced and environmentally friendly aircraft. The airline operates a fleet of more than 200 modern aircraft to a network of more than 150 key business and leisure destinations across Europe, the Middle East, Africa, Asia Pacific, North America and South America, including São Paulo and Buenos Aires. A multiple award-winning airline, Qatar Airways was named ‘World’s Best Business Class’ by the 2018 World Airline Awards, managed by international air transport rating organization Skytrax. Be the first to comment on "Qatar Airways Named Official Global Airline Partner Of CONMEBOL Football Competitions"